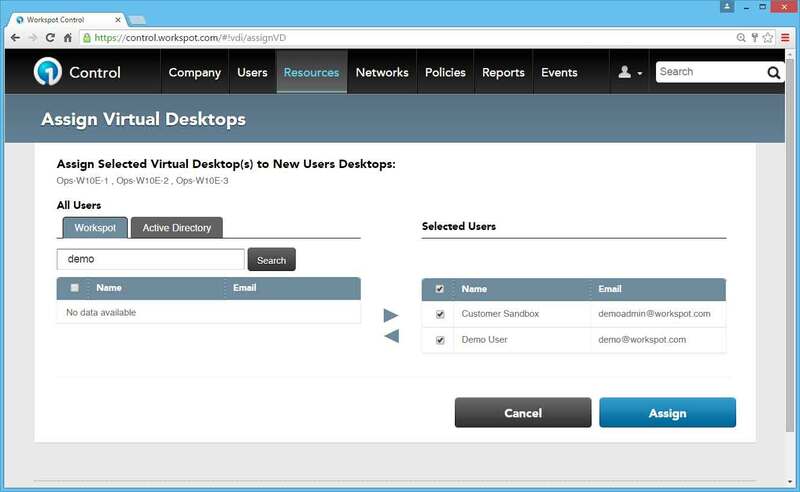 Workspot-Nutanix Integration provides a simple interface with easy access to Nutanix Acropolis - a turnkey VDI 2.0 infrastructure platform. 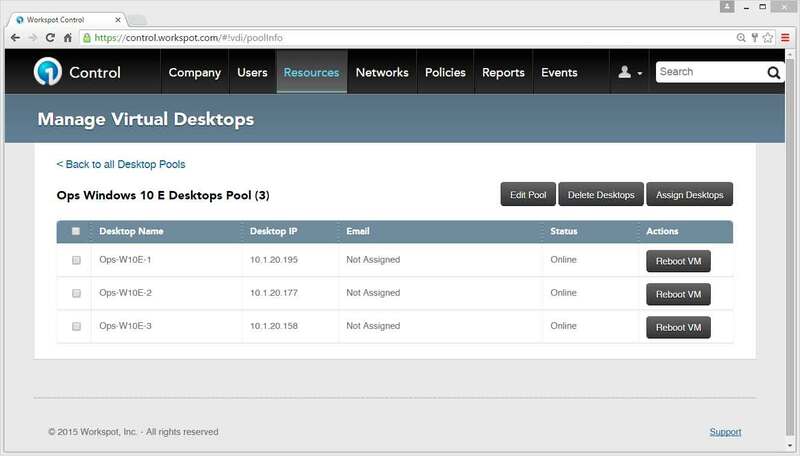 Workspot's Enterprise Connector provides the integration service between Nutanix deployments and Workspot Control. 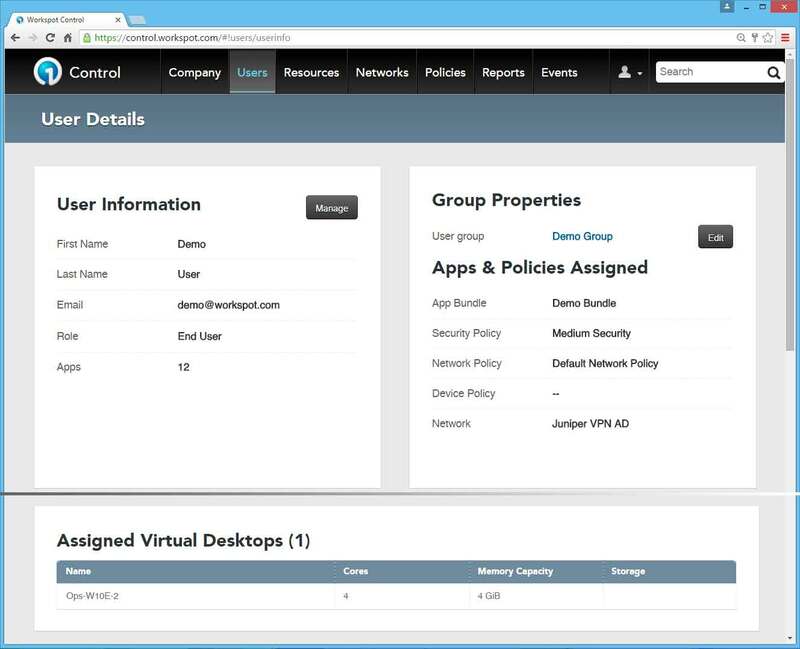 Control is Workspot's cloud-based, comprehensive management solution that radically simplifies the automatic provisioning of VDI desktops, in addition to managing configurations and policies for the environment. 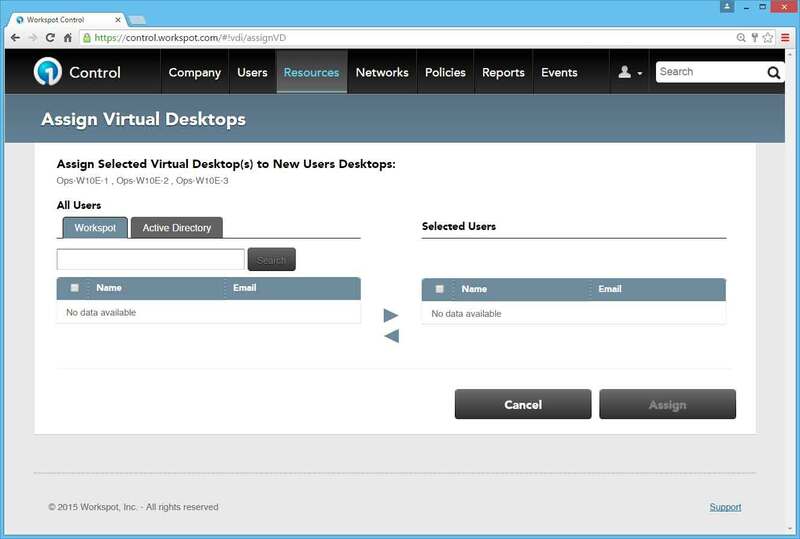 Setup your hyper converged infrastructure environment where your virtual desktops will be running, and make sure it is accessible from the internet. PRISM (Nutanix UI console) is optional but, at a minimum, you will need an Acropolis deployment hosting a single cluster-node configuration. 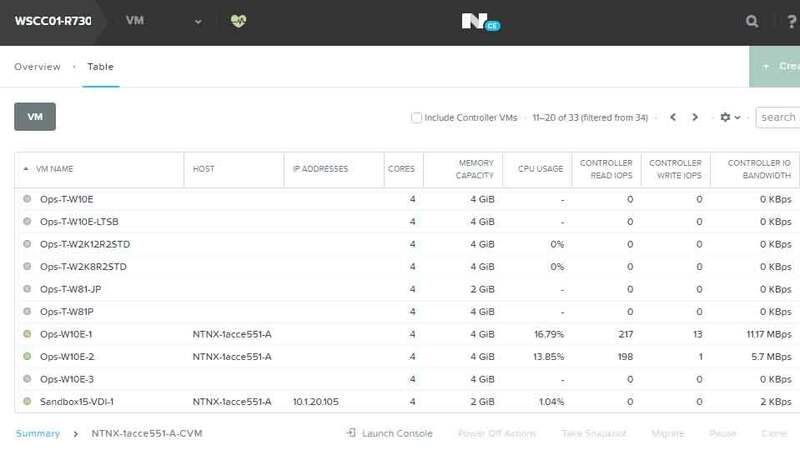 Create a Nutanix account on Acropolis for provisiong of the Virtual Machines (VMs). See the Nutanix website for more information regarding the Nutanix Xtreme Computing Platform and it's configuration. Add Datacenter and provide a name that describes the datacenter. Note: "Cupertino DC" is used in this example where DC is short for Data Center. 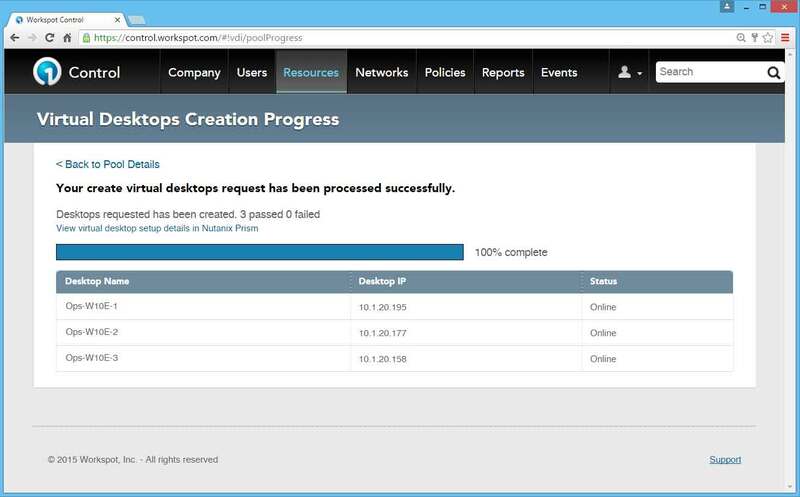 Add Configuration for the Nutanix Acropolis configuration type. 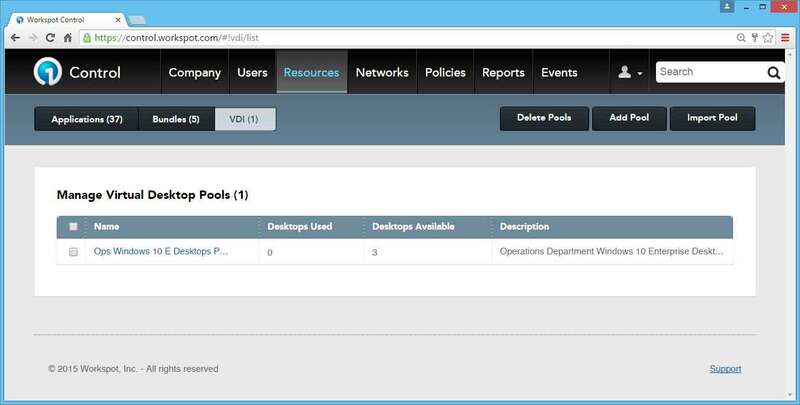 Add Pool to provision Virtual Machines (VMs). 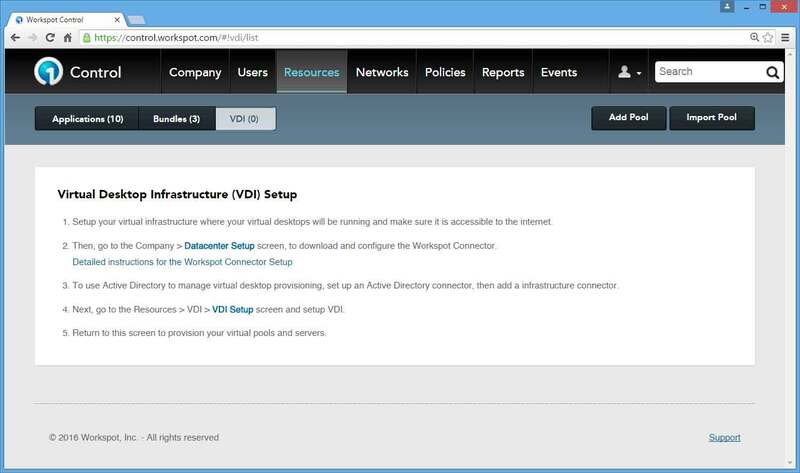 The Nutanix VDI is used by virutue of the integrated configuration defined. 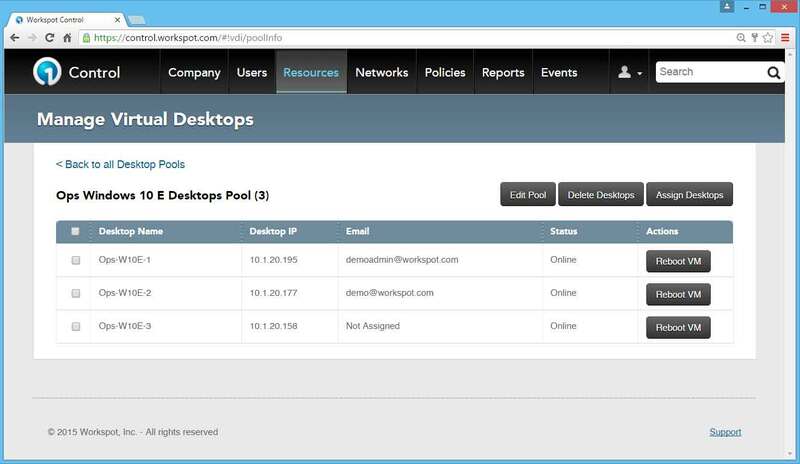 Assign Desktops in the pool to users using one of the following methods: (a) users defined in Workspot, (b) and/or users listed in a spreadsheet that is imported. Import Pool contained in a "csv" file that lists users, ip addresses, and other relevant information. Refer the screen shot of such a Sample CSV File at the end of this guide. 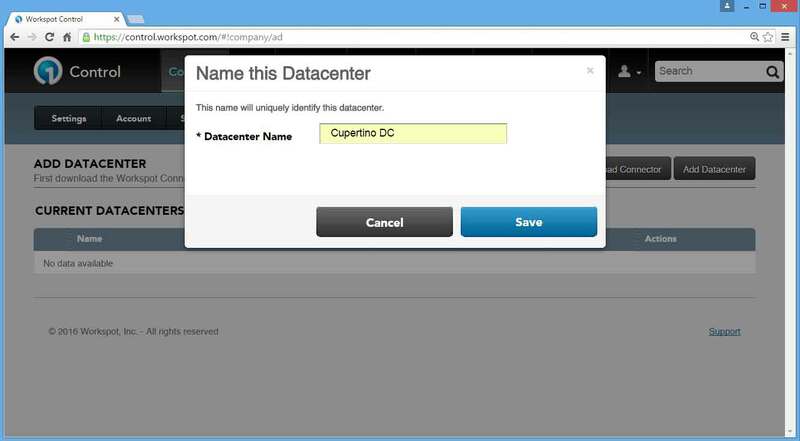 Provide a meaningful name to identify the Datacenter's profile. "Cupertino DC" is used in this example where DC is short for Data Center. Click on the Save button. 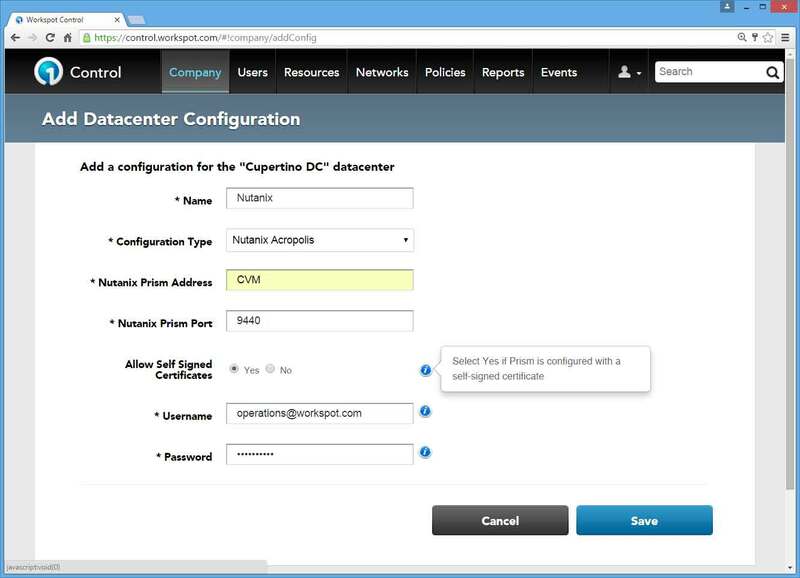 Add Configuration for Nutanix Acropolis: Navigate to Company > Datacenter and click on the Add Configuration button. The panel titled "Add a Configuration for the <datacenter name> datacenter" is posed. 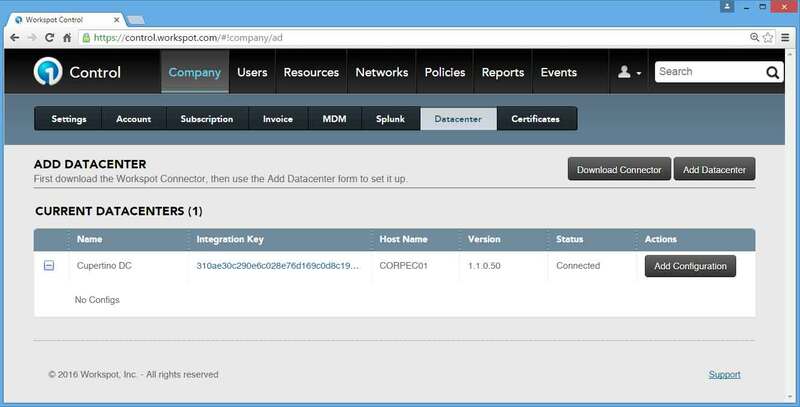 Provide a meaningful Name to identify this configuration profile, "Nutanix" is used in this example. 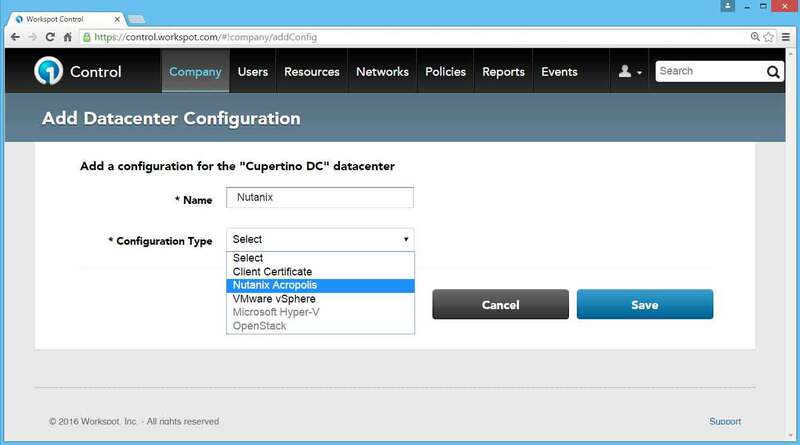 Select Nutanix as the Configuration Type. 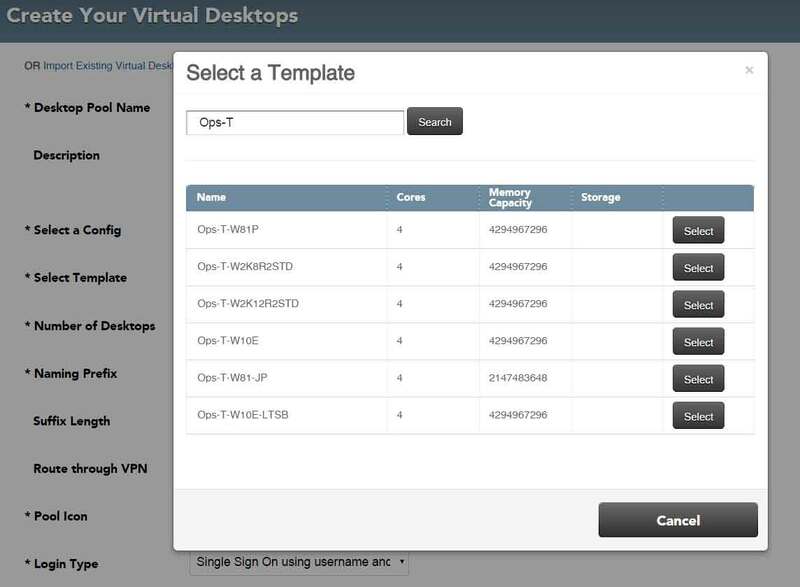 Figure 13 - Add Configuration - Nutanix - Configuration Type and Name. 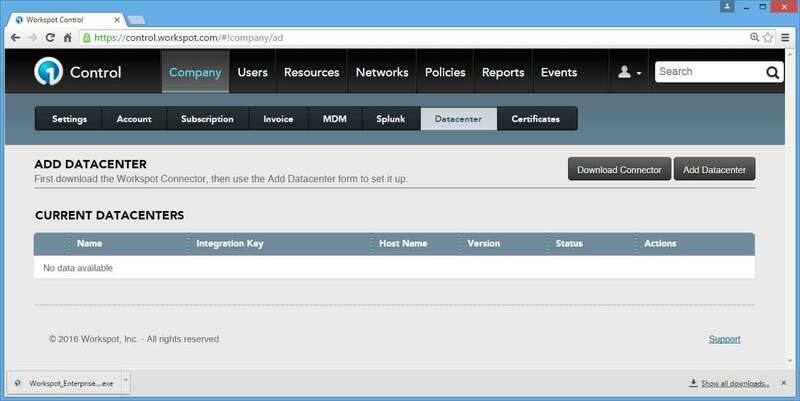 Enter the Nutanix Prism Address (IP address) - the FQDN or hostname of the PRISM web console may be used as well. The Nutanix Prism Address, shown in Figure 15 below, is the NETBIOS name "CVM". (Note: The IP address is listed in the PRISM VM table as the Nutanix Controller VM with a name similar in form to "NTNX-1acce551-A-CVM"). Enter Port number for management interface (Nutanix Default is 9440). Click on the Save button. 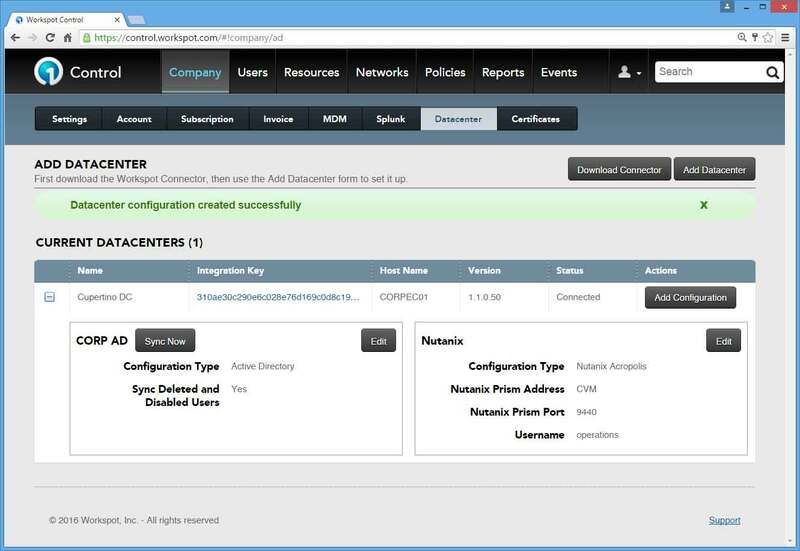 The "Datacenter configuration created successfully" message is displayed and the Nutanix configuration panel shows the Configuration Type, Host, Port, and User Name. 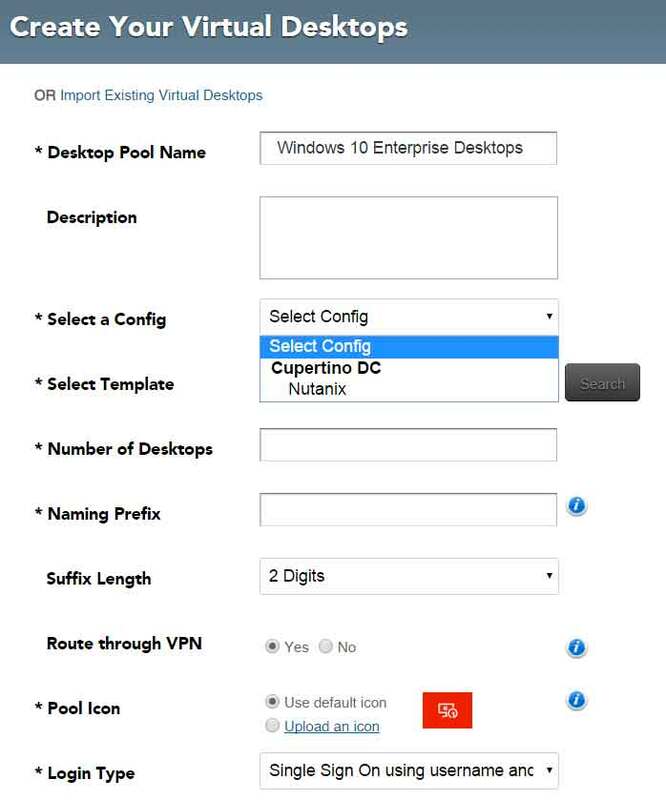 Figure 16 - Add Configuration - Nutanix - "Datacenter config created successfully"
Add Pool: Navigate to Resources > VDI to provision Virtual Machines (VMs). Click on the Add Pool button. 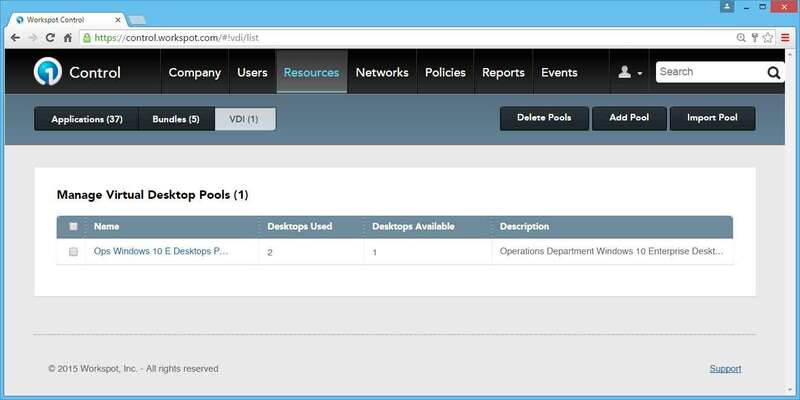 Optionally, you may click on the VDI Setup link in item (4.) of the instructions, as shown in Figure 2 previously, to arrive on the same page. Pools may also be created using the Import Desktops from Config option under Import Pool. Refer to Section 7 covering which covers importation of pre-defined VDI pools. 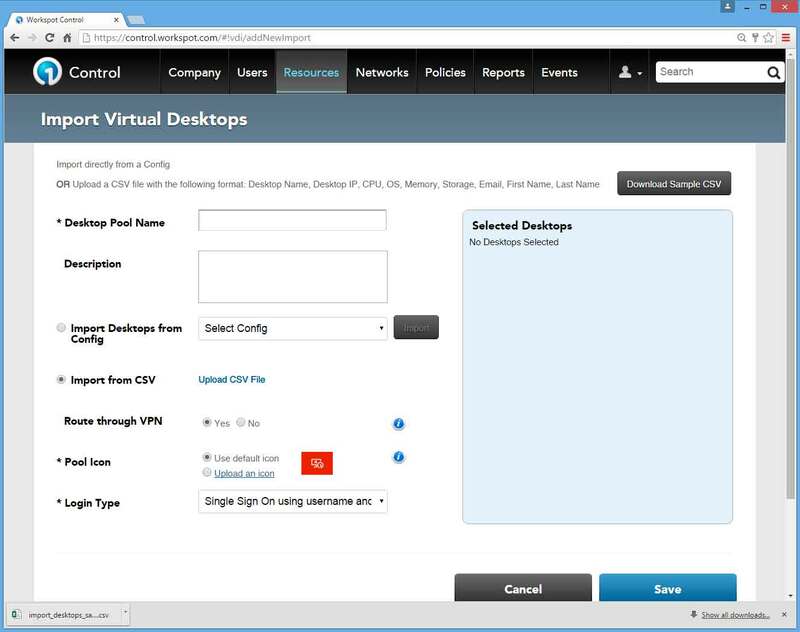 Assign Desktops: Navigate to Resources > VDI to assign Virtual Machines (VMs). Click on the Assign Desktops button. 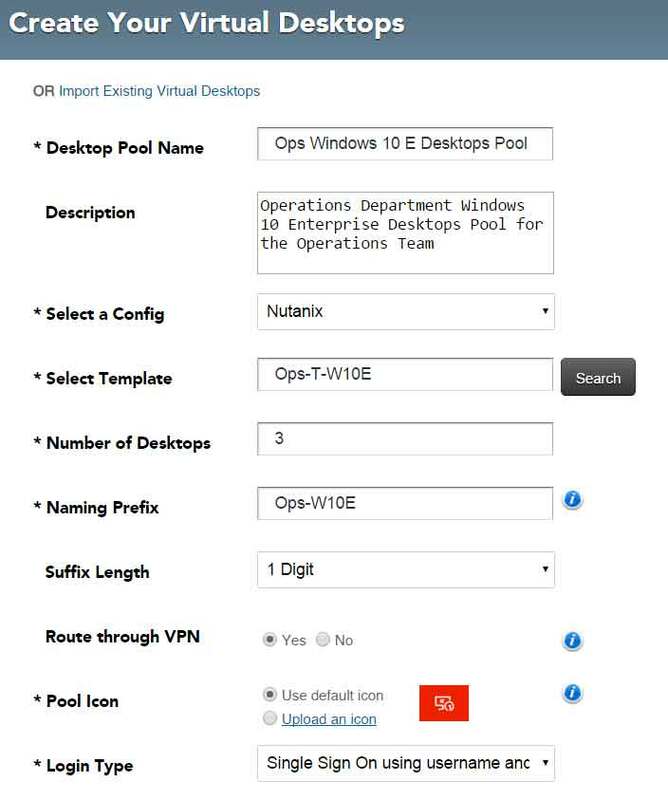 Click on name of the pool to open the Manage Virtual Desktops. If errors occur during installation and setup, look at the results in the "setup.log" file in the folder "C:\ProgramData\workspot\". If errors occur while the connector is running, look at the contents in the "connector_<date>.log" file in the folder "C:\Program Files\Workspot_Enterprise_Connector\log\". 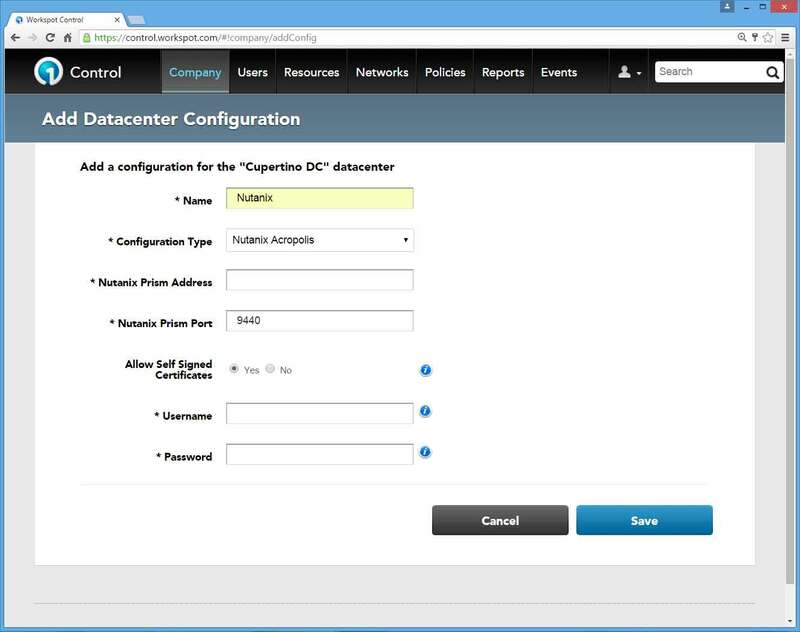 Figure 16 - Add Configuration - Nutanix - "Datacenter config created successfully"